This photo was taken in late May 2016. The location was on the sidewalk near the White House in Washington DC. The "Take It!" 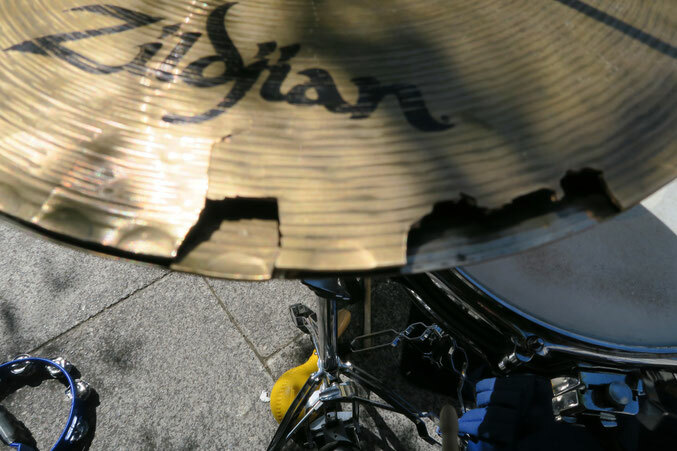 came from noticing the chunks of the edge of this cymbal that had been broken off and discarded. I had never seen such a thing before. Even though I am not a musician I had always thought that a drummers cymbals were an instrument that was chosen after trying out various combinations through the course of time. Once chosen, they often stay with a drummer for many years. This obvious altered state charged up my curiosity. The drummer was on a break, but I waited for him to return. He made his appearance after about 10 minutes and was most friendly. He was from Africa and was wearing a lemon yellow shirt. He told me that he and his band had been invited in to the White House and given a little concert for the first family. I do not think a street band could ask for too much more. I asked about the brass chunks taken out of his symbol and was told that it make a difference in the sound which he liked. The entire exchange was lots of fun, and I hope to see them again. All the best to each of you, and here is hoping you enjoy some great live music this summer. PS: I did not hear them play as they were on what turned out to be an extended break. While we were talking, an Afro-American young boy sat on the drummers seat and picked up some sticks and started to play the drums. The band members that were there, all complemented him, which brought smiles all around. The boy's Mother, was absolutely delighted. All great stuff. Even though there was not any organized music played, there was certainly joy in all of the intertwined human interaction that took place. I walked away, having made a mental note, to put a star in my book of life is great that I keep in my mind.